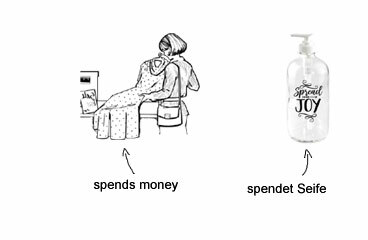 spenden meaning | German is easy! And those two are actually not THAT far apart. Still, there’s a lot of room for confusion. I spend 150 Dollars on Sushi every day. Ich spende jeden Tag 150 Dollar für Sushi. Because while the English sentence makes you sound like a rich snob who is completely out of touch with the reality of the common man, the German sentence makes you sound like… uhm… a generous rich snob. Who is totally out of touch with the reality of the common man. I mean, seriously… donating 150 bucks for Sushi. Come on.